Etorphine (M99) is a semi-synthetic opioid possessing an analgesic potency approximately 1,000–3,000 times that of morphine. It was first prepared in 1960 from oripavine, which does not generally occur in opium poppy extract but rather in "poppy straw" and in the related plants Papaver orientale and Papaver bracteatum. It was later reproduced in 1963 by a research group at MacFarlan Smith in Gorgie, Edinburgh, led by Professor Kenneth Bentley. It can also be produced from thebaine. Etorphine is available legally only for veterinary use and is strictly governed by law. It is often used to immobilize elephants and other large mammals. 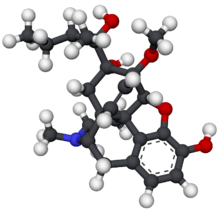 Diprenorphine (M5050), also known as Revivon, is an opioid receptor antagonist that can be administered in proportion to the amount of etorphine used (1.3 times) to reverse its effects. Veterinary-strength etorphine is fatal to humans. For this reason the package as supplied to vets always includes the human antidote as well as etorphine. The human antidote is generally naloxone, not diprenorphine, and is always prepared before the preparation of etorphine to be immediately administered following accidental human exposure to etorphine. The LD50 in humans is 30 μg which led to the requirement that the medicine include an equal dose of an antagonist, diprenorphine or naloxone. One of its main advantages is its speed of operation and, more importantly, the speed with which diprenorphine reverses the effects. The high incidence of side-effects, including severe cardiopulmonary depression, has caused etorphine to fall into disfavor in general veterinary practice. However, its high potency combined with the rapid action of both etorphine and its antagonist, diprenorphine, means that it has found a place for capture of large mammals such as rhinoceroses and elephants; under these circumstances both rapid onset and rapid recovery are very important characteristics. The high potency of etorphine means that sufficient etorphine can be administered to large wild mammals by projectile syringe (dart). Etorphine is an extremely potent, non-selective full agonist of the μ-, δ-, and κ-opioid receptors. It also has relatively weak affinity for the nociceptin receptor. Etorphine has an LD50 of 30μg in humans. Its mu affinity is 0.024nM compared with nalorphine nM 0.559Nm and diprenorphine 0.072kI so the compound naloxone would need large doses as it battles for space on receptors. Diprenorphine Carfentanil has a Ki of 0.0000007. In the Showtime television series, Dexter, the lead character immobilizes his victims using etorphine. In the TV show Lewis, season 6, episode 1, an assassin uses etorphine to kill two people. In the TV show Scandal, season 2, Episode 7, Quinn asks Huck, a former spy, which drug is best for immobilizing people; he responds "etorphine". In the TV show Bones, season 10, episode 13, etorphine is used on an ex-con before he escapes and gets blown up. In the TV show The Vampire Diaries, season 5, episode 6, etorphine is used on Professor Wesley Maxfield to knock him out so Katherine and Caroline can get some answers about vampire test subjects. In the novel The Viscious Vet: An Agatha Raisin Mystery by Marion Chesney under the nom de plume M.C. Beaton, etorphine (Immobilon) is used to murder a vet. ↑ Bentley KW, Hardy DG (June 1967). "Novel analgesics and molecular rearrangements in the morphine-thebaine group. 3. Alcohols of the 6,14-endo-ethenotetrahydrooripavine series and derived analogs of N-allylnormorphine and -norcodeine". J. Am. Chem. Soc. 89 (13): 3281–92. doi:10.1021/ja00989a032. PMID 6042764. ↑ Aggrawal A (1995). "Chapter 3 Opium: the king of narcotics". Narcotic Drugs. New Delhi: National Book Trust. pp. xvi+161. ISBN 81-237-1383-5. ↑ Bentley KW, Hardy DG (1963). "New potent analgesics in the morphine series". Proceedings of the Chemical Society. 220: 189–228. doi:10.1039/PS9630000189. ↑ "Etorphine HCl". Veterinary medicine for wildlife: immobilisation medicine for animals zoo animals. Zoo Pharm. ↑ Gavril Pasternak (17 April 2013). The Opiate Receptors. Springer Science & Business Media. pp. 444–. ISBN 978-1-60761-990-1. ↑ Hawkinson JE, Acosta-Burruel M, Espitia SA (February 2000). "Opioid activity profiles indicate similarities between the nociceptin/orphanin FQ and opioid receptors". Eur. J. Pharmacol. 389 (2-3): 107–14. doi:10.1016/S0014-2999(99)00904-8. PMID 10688973. ↑ Lewis, J. W.; Readhead, M. J. (1970). "Novel analgetics and molecular rearrangements in the morphine-thebaine group. XVIII. 3-Deoxy-6,14-endo-etheno-6,7,8,14-tetrahydrooripavines". Journal of Medicinal Chemistry. 13 (3): 525–527. doi:10.1021/jm00297a041. PMID 5441135.